This knitting lady with spinning wheel is one of the DIY paper dolls from my series of Marie Antoinette paper doll parade characters. All characters print two sides and stand on their own, so they can be used in the center of a table and enjoyed from all sides. They also look good running across a mantle. They can also be hanging decorations (instructions included). Collect them all! 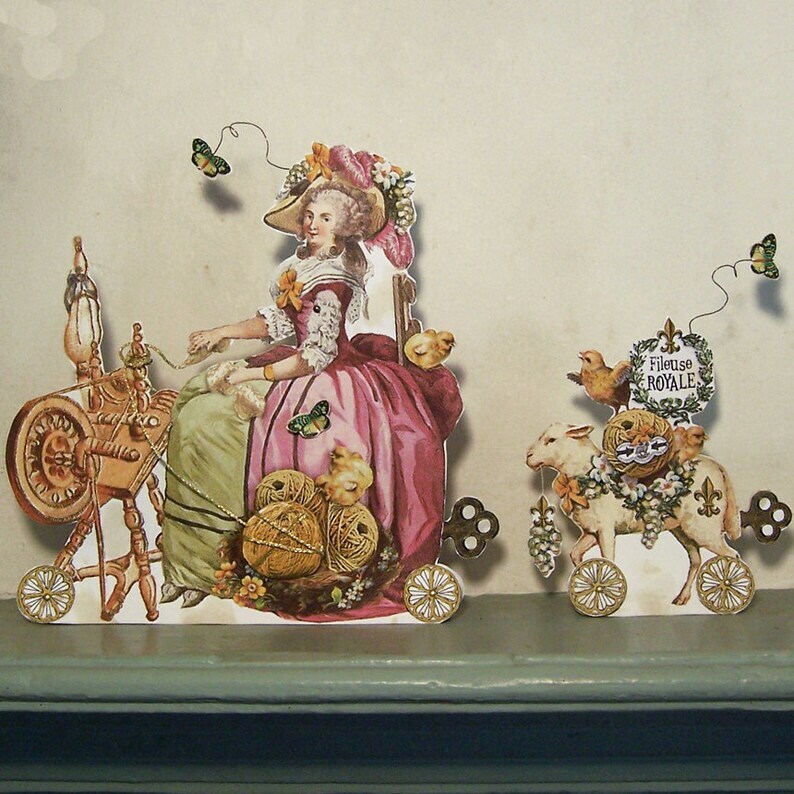 Many of my customers use the dolls as unique 3D greeting cards. They write a special message on a hang tag and attach it to the doll to personalize it to the occasion. Simply print out in color, cut, assemble, and stain the cardstock character with coffee to make it look like an actual antique! MA18 - There is a scandal in the palace. Madame Orlena travels to visit the queen and to demonstrate how she spins wool into gold. Little does she know that she will be taken into custody and forced to spin her golden yarn for the good of the empire. Some parts dangle by threads and wire. Wheels spin. Arm moves. BUYER NOTES: Digitals are not returnable. You will get both jpg and pdf files. See my policies for more info on digital downloads and printing them.